It literally took me 18 years of self-study, trial and error, and taking risks (and spending money on tools that didn’t work for me) to make my blogs running the way they do now. You don’t have to make the same mistakes I did, and you sure don’t need to waste months or years of your life to get it right. I put together this list so you can save yourself those precious hours and unnecessary costs by investing in the right tools—and only the essentials! Here are the tools I use to run and grow my blog/s. If they’re on this list, it means I HIGHLY RECOMMEND them. Some of these links are affiliate links. Read my disclosure policy here. Web Hosting and Domain Registration. I’ve tried several web hosting providers in the past 2 decades, and I’ve never been more confident about recommending a web host until I transferred to Siteground. Very affordable, super fast uptime, but my favorite feature is their very reliable 24/7 chat support that’s unlike any other. Seriously guys, the best web host I’ve been on, considering I’ve dealt with quite a lot of horrible ones. Sign up with Siteground HERE. Read why I think Siteground is the best web host for bloggers. Content Management System. Hands down the most reliable open-source content publishing software that’s been tried and tested through time. Highly recommended for content-based websites and personal blogs. If you’re using Siteground, you can easily install WordPress through the Siteground panel. Online Shop and E-commerce Management. Shopify is THE BEST when you want to set up shop and promote your products online. We’ve been using Shopify for our letter board business, Lettergram PH, and we love how easy it is to build an online shop (drag and drop! ), update product pages, create discount codes, cross-promote products on your social media pages and receive payments without delays. Start selling with Shopify HERE. Genesis is like WordPress on steroids. It allows you to easily build powerful, beautiful, and search engine optimized websites with WordPress. Highly recommended by professional bloggers and digital marketing experts. Check out Genesis and Studiopress HERE. 17th Avenue is a recent discovery but immediately became one of my favorite Wordpress theme shops. In fact I currently use one of their themes on my other blog. They have a range of clean and sophisticated themes perfect for lifestyle and beauty bloggers. Shop 17th Avenue themes HERE. Restored 316 specializes in classic and feminine WordPress themes that are just soo pretty! Built on Genesis Framework, Restored themes are not just pretty but also fully optimized and packed with features. Take the quiz to know which Restored 316 theme is best for you HERE. This blog you’re reading now is built on a WordPress theme by Station Seven. Classic, minimalist, designed for creative bloggers and entrepreneurs! They have Squarespace templates too if that’s your thing. Shop Station Seven HERE. If you want to take your email list building to a whole new level of awesome, Converkit is worth the investment. Highly recommended for bloggers, freelancers, and entrepreneurs who want to go into content publishing and information-based business. Check out Convertkit’s features HERE. For basic email list building and newsletter requirements, Mailchimp does the job. I started with Mailchimp and used it for years before moving to Convertkit. Readers sometimes get turned off by bad grammar and poorly written sentences. I run all of my content through the Grammarly filter to make sure that my content is grammar/typo error-free. It catches all the grammar and typo errors I wouldn’t have caught otherwise, which is a relief. It has a Chrome extension that works with WordPress, so plus points for us WordPress users. Sign up for a free Grammarly trial here. This Purposeful Blog Planner is a no-fluff, minimalist blog planner pages for purpose-driven, creative and lifestyle bloggers. 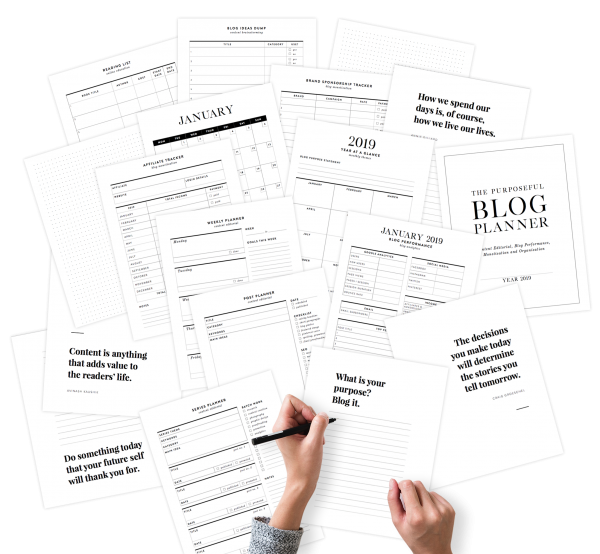 Comes in A4 and US letter versions, this blog planner has 32 printable minimalist layouts and inserts that will help you create and organize your blog editorial and content strategy. Purchase The Purposeful Blog Planner here. Social Media Scheduling Tool. If you plan on leveraging Twitter and Facebook, Buffer is a good tool to manage and schedule your posts. More than the tool, I specifically love the community and the social media resources they publish on their blog. Pinterest Scheduling Tool. So I jumped into the bandwagon of Pinterest marketing, albeit hesitant at first. But soon as I crossed over, I realized just how much I’ve been missing! Tailwind makes Pinterest promotion so efficient and makes your Pinterest promotion a well-oiled machine. Get Tailwind HERE. I’ll keep updating this page, so keep checking for updates! Ready to start blogging with purpose? PRO VERSION. Dated 2019. 58 printable pages—45 planner pages, 12 inspiring inserts and motivational prompts, plus free dotted grid templates.